Here is part two of a three part poem by my great grandfather L.J. Schlattman, from his book of poetry "Gleanings from Life". For part one click here. Naught but glory now I see. If thou wilt put thy trust in Me." And did'st let the serpent in." With his death on Calvary." Here is part one of a three part poem by my great grandfather L.J. Schlattman, from his book of poetry "Gleanings from Life". All its vanity I see. Greed, to "bilk then, if you can." Makes a hell of human life. Without hope and without God! Where is God? What is His plan? OK, this is some pretty blatant filler material, but I've been too busy to write a serious post, so you will have to bear with me. I would guess it is pretty common for anyone who make their living turning wrenches to have a tool box with a bunch of pictures fastened to the inside of the lid, so that with the tool box open, you have a sort of gallery facing you. Normally there will be pictures of the girlfriend or wife (hopefully not both), children, and as you get to be my age; grandchildren. Sprinkled in with those there will usually be some pictures of you favorite car or motorcycle. My tool box is no different. Since they were getting loose, curled up and in need of remounting, I thought I would share some of the motorcycle pictures that have been on my box for more years than I care to recall. This picture is from the spring of 1982. 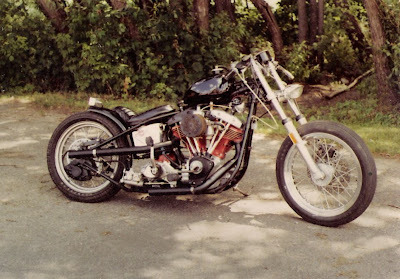 I had just built my first Knucklehead, leaving my '75 Shovel free for a little serious hot rodding. 88 cubic inches with an SU carb and 468+ Sifton cams gave it some "git up an go". Goodyear roadrace rain slick was very soft and sticky. Pete and me. 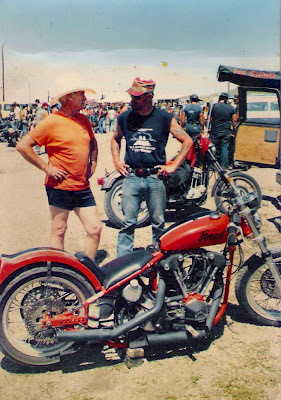 This was at a 1986 AMRA drag race in Belle Fouche, S.D. Dave, my friend and pit crew, asked the legendary Top Fuel Knucklehead racer to come over and look over my bike since he knew that Pete was my hero. Pete graciously obliged, and even humored me by rubbing the tank to instill some of his magic. That resulted in a new National record. This has always been a favorite picture. 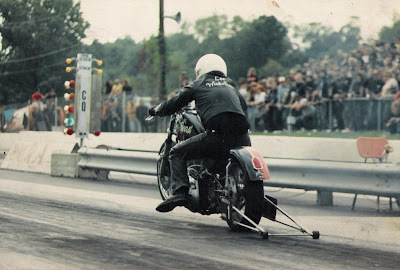 Some would say that I have the wheelie bars set too high, but I have always maintained that they are more fun to ride that way. This was taken at the National Finals in Clarksville, TN. I think the year was 1989. Here is our son Joey at the Sturgis Nationals on his 1200cc XL. I think he was either 16 or 17 years old at the time. 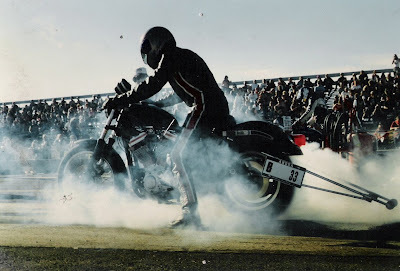 As you can see, he learned how to do a smokey burnout early on. 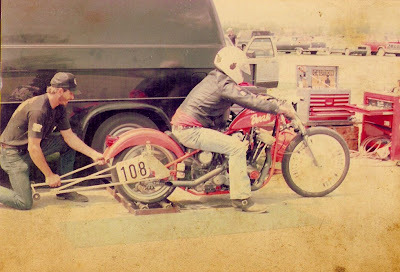 If you follow this blog regularly, you may be wondering how the vintage Drag bike (Vinnie for short) is progressing. This will be a quick update. I have tried to spend a few minutes on the bike every day, rather than spending large amounts of time all at once. Last week I worked on the heads. The intake ports looked fairly good, a testament to whoever did the original work on these heads "way back when". I did a little clean up on the intakes, but got a little carried away with the exhaust ports. If you ever look carefully at Knuckle exhaust ports, you will notice that they have more humps and deep valleys than they should. The port shape seems to have been determined more by the shape of the outside surface of the head than by what was needed to get the exhaust out. I couldn't resist filling in these valleys in an effort to improve the exhaust ports. I cut out a piece of steel to fit in each valley and then brazed them in with enough extra brass to smooth thing out nicely. After polishing, the exhaust ports are looking pretty nice. 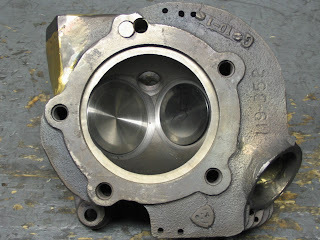 Since the engine will not get any top end oiling, it will also not get spring covers (cups). This makes the valve job much simpler. For one thing the guides can be installed very simply, without worry of oil leaks. 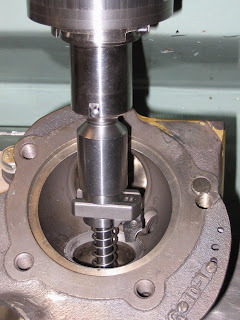 It also makes custom guides for the 5/16" stem intake valves much simpler. All I had to do is get a couple of guide blanks from Rowe and turn them down to the appropriate diameters and lengths. Unfortunately the blanks are only .750 O.D. to begin with, so they are not the best answer if using spring covers. After installing the guides I replaced the exhaust seats. It has been my experience that the stock seats are so hard that it is very difficult to machine them; particularly for a high tech radius seat. Better to get new ones in there now and make the rest of the job go smoother. I finished cutting the seats with a radius profile on exhaust and a 5 angle on the intakes. This is the same intake seat profile that I use for all of my porting (the 5 angle gives better wet flow characteristics on the intake than a full radius). So far, so good, but there is still much to do!